This is from an article by Lincoln Eiley, of Corozal Daily. He has had the same problem we have of not being recognized as local press to cover the Wedding Re-enactments at Chactemal (Santa Rita). This is reproduced with his permission. 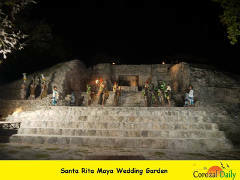 Mar 24 – On Saturday March 22nd, Corozal Junior College (CJC) rendered a spectacular display of a Maya wedding at the Santa Rita Archaeological Park, now the official site of the Maya Wedding Garden. Guest speaker of the event was Darrell Bradley, Mayor of Belize City. Mr. Roy Rodriguez recounted the importance of the Santa Rita site to Belize and its history. The re-enactment of the Mayan wedding was to honor Corozal’s rich culture and heritage to greatly benefit generations to come. All proceeds for the event will be used to improve the Santa Rita site. Videos and photos were reserved to two media companies and one photographer but no Corozal media was announced, so we bring you only one photo of the event that we took at our own risk. BTIA Corozal announced that the site is now available for private weddings and is responsible for all the logistics. Rosita Mai, Dalia Castillo and Leni Alcoser are responsible for organizing all private weddings at the site. The event was organized by the Corozal Chapter of the Belize Tourism Industry Association (BTIA), NICH, Corozal Town Council, Corozal Junior College and stakeholders in the industry. Atlantic Bank Ltd. was a sponsor. Printed from https://chactemal.com — Maya Wedding March 2014.